A free downloadable lesson about why smiling, even when we don’t feel much like it, can actually make us happier. The lesson starts with a short video, demonstrating the impact of smiling on the ‘miserable’ people of Edinburgh. After some brief discussion, the students go on to read a text about the various scientific findings about the emotional impact of smiling. The text and task would be suitable for students preparing for IELTS, especially at a lower level, but is suitable for a General English class as well. Finally, the lesson looks at a lexical set of idioms to describe emotions, and the students are asked to discuss how different situations might make them feel. 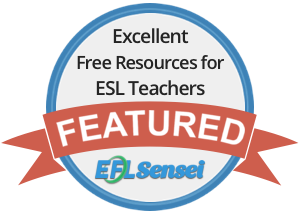 Thank you for sharing skilled resources functional for a target language. Can you imagine how difficult the scientists must have found it to keep a straight face? I teach at an International School in UAE. I find it difficult to deal with people that almost never smile. So, I teach my students smile. They have learned but the teachers from different cultures all over the world, even Canadians that are not that far from the USA, think that the weird American teacher is wasting her and their time….People learn, but at a such a slow pace that sometimes a lifetime is not long enough…. It can be difficult when a culture is very different to your own, can’t it? I worked in Brazil for a couple of years, where everyone was VERY touchy-feely. That took a bit of getting used to, though I liked it. But then I moved to Poland, which is much more reserved, and it was quite a culture shock. Hi Rachael, thank you for a wonderful lesson, it is interesting and informative, i can’t wait doing it with my students. People here in Russia smile very seldom and i think this lesson will help me create more relaxed and friendly atmosphere during classes. A very interesting topic and well-planned lesson. I’ve used it with my students who really enjoyed every part of it! Thank you!!! Pingback: Recap of Resources and Interesting Blog Posts – 25 March 2013 | Stop Complaining – Enjoy Teaching! This is what I was looking for… thank you for sharing it with us! Oh, good stuff! Keep smiling in all difficulties! The lesson is helpful & informative! Brazilian students are always happy when learning a foreign language, they can laugh at themselves. This is a great lesson plan. Thank you for sharing. BTW, sometimes I have a hard time trying to get my students back on track again after having such a great fun. Thanks very much for commenting, Cle. I spent two years teaching in Brasilia, and I remember the students as being able to get a lot of fun out of almost anything. Saudades. Next time you come to Brazil you should visit Rio Grande do Sul and its capital city Porto Alegre. I’m sure you will enjoy it. Best wishes and thank you for these amazing “teaching ideas”. I’ve never been to Porto Alegre, but have heard it’s great. What a wonderful name, for a start! Check this out, Rachel. Hope you like it. Looks fantastic. I remember reading something about the innovative participatory democracy there.